I cleaned out the laundry cabinet that has been sitting on our back deck for the past two years. It seems I may actually get a laundry in the near future and the cabinet made it’s way back inside, but not before I removed piles of random junk from inside it. Among the junk I found a surprising number of nuts bolts and screws which somehow didn’t make it out to the shed. They sat on my kitchen bench for a few days before I decided to take matters into my own hands… and paint with them! 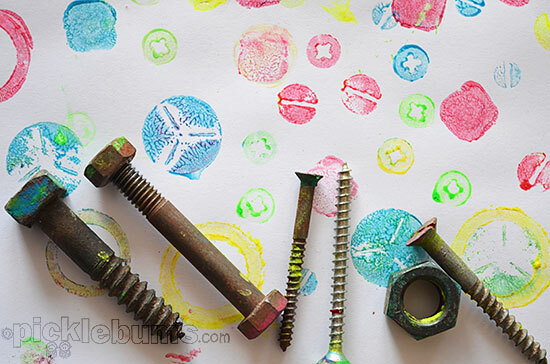 Printing with Nuts and Bolts and Screws! A damp cloth to wipe hands. Of course that laundry cabinet didn’t have any sponges in it so I cut up some polar fleece and put it in a recycled plastic tray to make our stamp pads and it worked great. I put a good dollop of paint into each section and swished it around till it had soaked in a little and then we were ready to print. 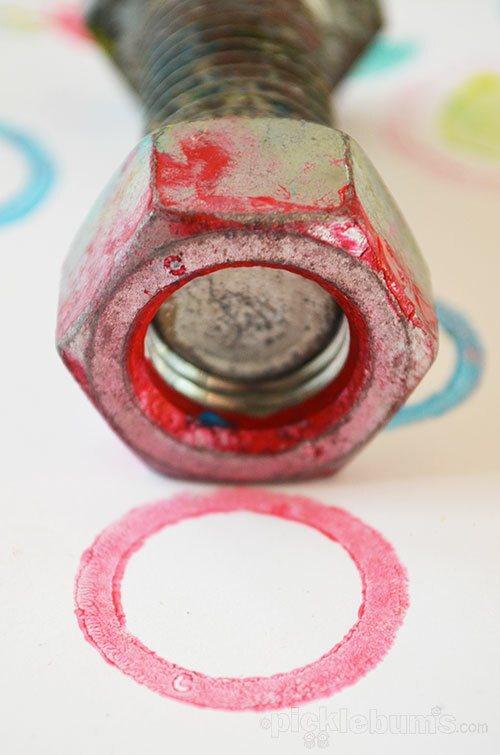 We were quite surprised that the hexagonal nuts didn’t print hexagonal shapes! It wasn’t until we looked closer that we saw there was a clear circular rim sitting higher than the hexagonal shape, which is what printed. We discovered some of the bolts had numbers and letters on them that printed onto the paper. Our favourite were the screws with the different patterns on their heads which made really interesting prints. 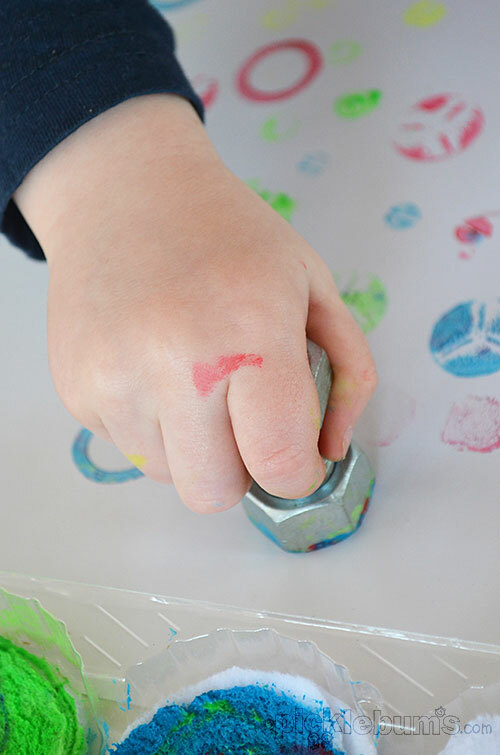 The bolts and screws were the perfect size for little hands to manipulate and this was a quick and easy art activity that was lots of fun. 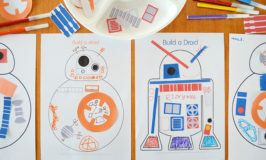 We think these prints would make great cards or wrapping paper! Do you like printing? What other objects have your printed with? You can find more of our printing activities here. My hubby is a carpenter, and we were just sorting through a box of his odds and ends yesterday. 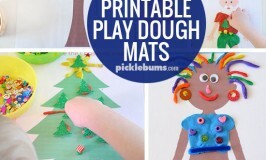 Using them for printing is a fab idea. I particularly love the prints with letters and numbers. Funny, write before I read your line about wrapping paper I thought to myself this would make the perfect wrapping paper for my dad who always does woodworking projects with my kids :-) As always, your posts are inspiring! Yay, Play! Funny, right before I read your line about wrapping paper I thought to myself this would make the perfect wrapping paper for my dad who always does woodworking projects with my kids :-) As always, your posts are inspiring! Yay, Play! I love this Kate! We always have a handful of these hanging around in any given room (my hubby is in construction). I’ve never thought to use them to create art! This is a brilliant idea! 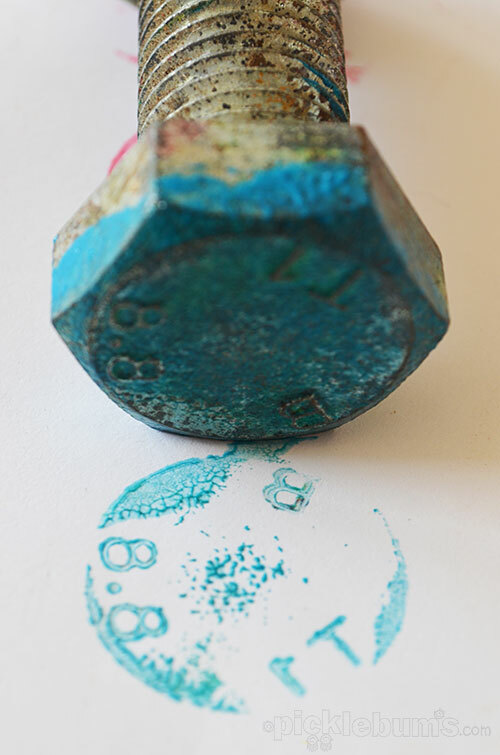 I love how you created your own stamp pads from the polar fleece. I’m going to be giving that a go in the future. Love the bright fluro colours you’ve used in this post too. I LOVE this, and want to do it right away. Gorgeous photo, too! 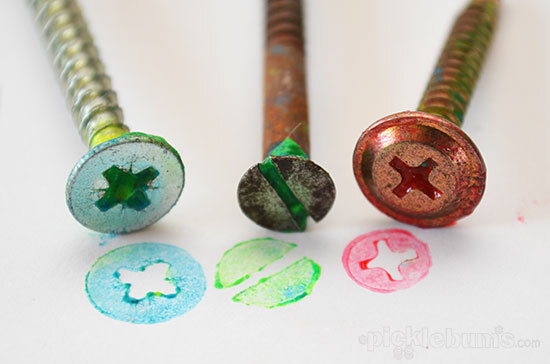 I have never thought to paint with nuts and bolts…its a cool idea!! 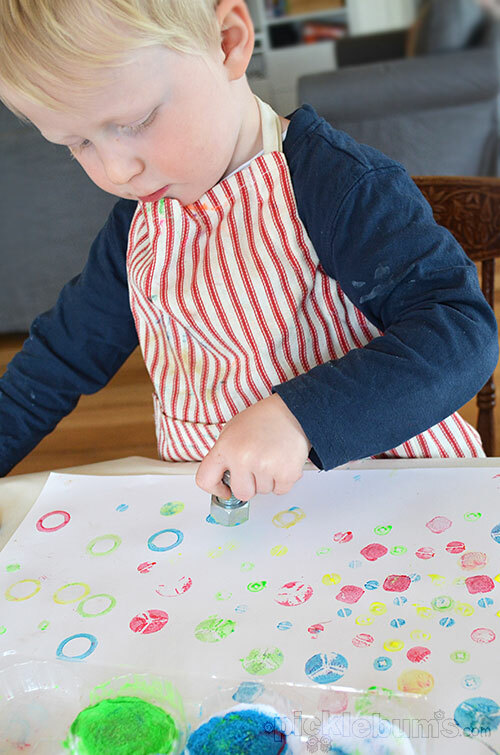 I also love the aprons your kids wear for painting…where did you find them? My son would love this. I love all the textures the nuts and bolts make. You’re so awesome. This is the coolest idea ever! Great idea for the “stamp pads” out of polar fleece. I’ve always used paper towels that never work well. Your idea is much better. I love gadget painting. Thanks. What a super idea! 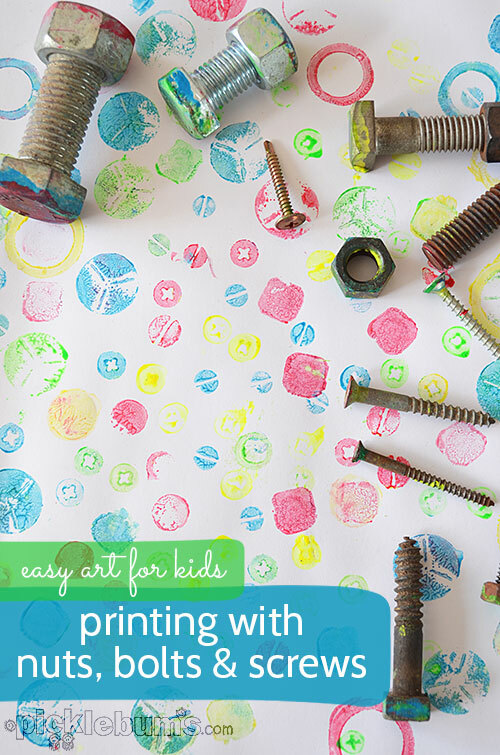 We did sponge printing which was lots of fun but reading you post on printing with bolts made me think there are so many different things you can do printing with… Endless fun! Many thanks we will no doubt be doing loads more printing! The print pads are a great idea too… Less mess if they get knocked over! Thanks. 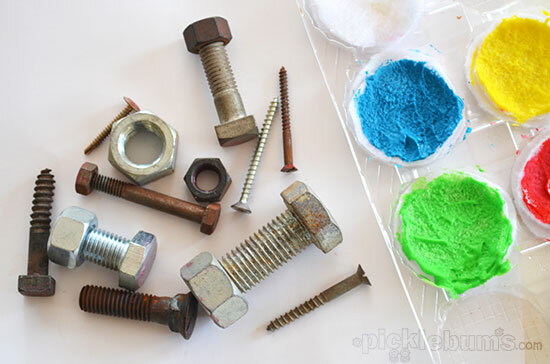 I tried washable paint but it is kinda thin and not getting on well on slippery steel of nuts and bolts and somehow not giving a good print on the paper.